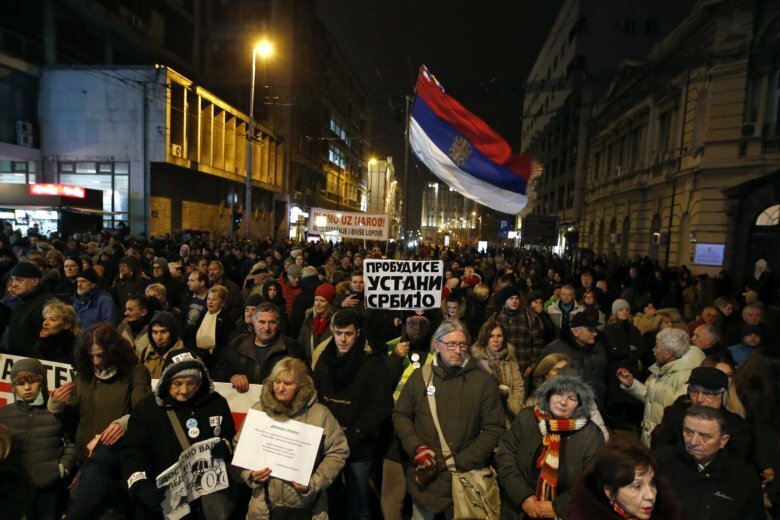 BELGRADE, Serbia (AP) — Several thousand people have marched in Belgrade for the seventh week of protests against what they say is Serbian President Aleksandar Vucic’s autocratic rule. The protest Saturday comes after Vucic’s party bused tens of thousands of his supporters into the capital during Russian President Vladimir Putin’s visit on Thursday. Vucic’s critics say the gathering was his attempt to show that he has many more supporters than opponents in Serbia. Chanting “Vucic Go Away!” the whistle-blowing crowds marched to the state TV headquarters, which has largely ignored the weekly protests. Critics accuse the president of imposing an autocracy through strict control over the media and promoting hate speech against opponents. Vucic rejects the charges.